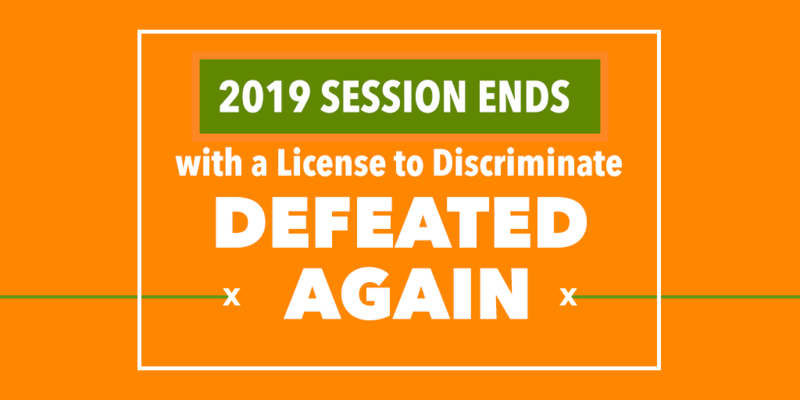 The legislative session ended yesterday with a broad license to discriminate defeated again—for the sixth year in a row. It was possibly the weakest attempt anti-LGBTQ lawmakers have yet made. They couldn’t even get their bill a committee hearing because of the threat of an outcry from the coalition we’ve spent these six years building: Businesses large and small, faith leaders, community advocates and thousands of individual Georgians who know anti-LGBTQ discrimination hurts our economy and our communities. It’s become routine at this point. Year after year, anti-LGBTQ lawmakers tee up discriminatory legislation, and we knock it down. That doesn’t mean we should stop being vigilant about bad bills—this year’s license to discriminate will still be active legislation in 2020—but it does mean we have an opportunity to move beyond the attacks and toward a proactive vision for nondiscrimination in Georgia. Lawmakers have the opportunity now to get serious about enacting LGBTQ-inclusive civil rights protections statewide. That’s the whole point of our new campaign, Peach State, We’re Late—that Georgia is one of only a few states without statewide civil rights protections, and we need to fix that now. It’s clearer every year that Georgians want these protections. Polling just released in March from PRRI shows that a majority of people in every state—including 65 percent of Georgians—want laws that protect LGBTQ people from discrimination. The political will is growing too. Of course, this session wasn’t all victories, but it was successful for LGBTQ nondiscrimination. In addition to defeating a bad bill, pro-LGBTQ lawmakers again introduced an LGBTQ-inclusive civil rights bill. We also saw an LGBTQ-inclusive hate crimes bill move through the House, the first-ever LGBTQ-inclusive bill to move in the legislature. And as much as we talk about how anti-LGBTQ bills hurt our economy, defeating them can only do so much. The fact is that until LGBTQ people are explicitly protected from discrimination in Georgia, we simply are not doing enough to encourage growth and investment. Before the next legislative session, we’ll be working hard to take this argument to lawmakers.